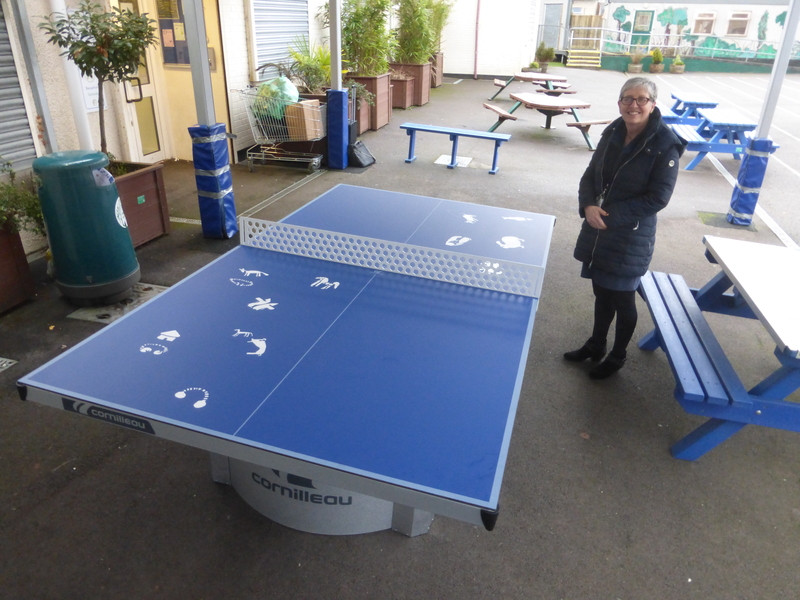 Jane Holland, Assistant Head Teacher at Woodlands High School with the completed ‘Romanobritish’ table tennis table. Caer Heritage Project artist Paul Evans has been busy recently, completing work on our Romanobritish table tennis tables or ‘Ping Pong Portals to the Past’. 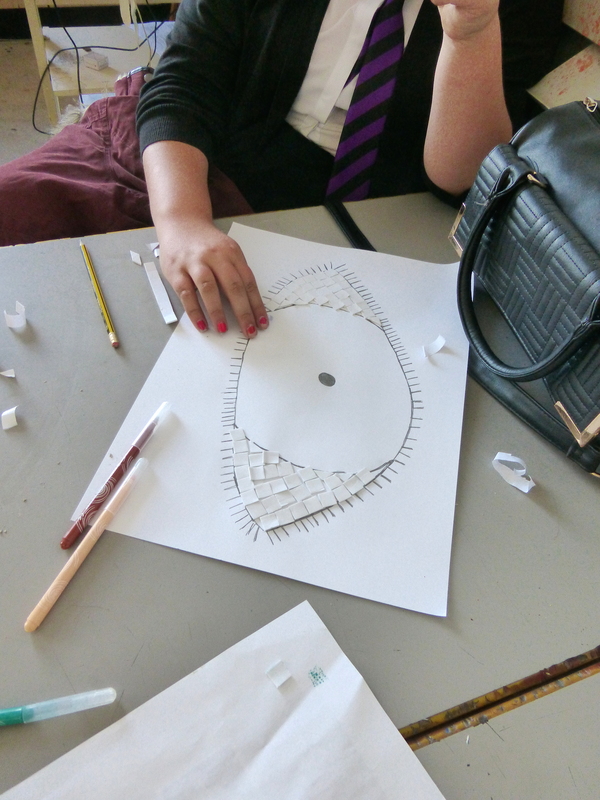 One of the many designs created by young people from Woodlands and Glyn Derw High Schools during the Romanobritish creative workshops. 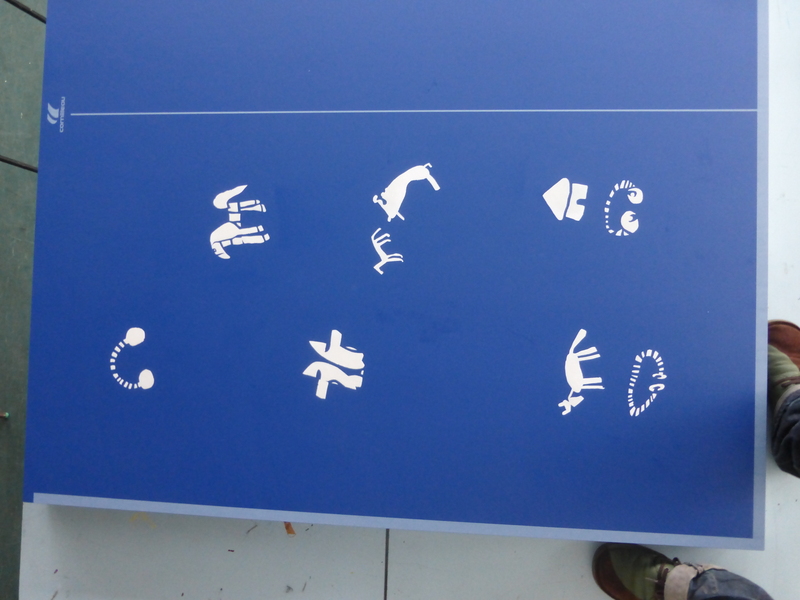 Using these designs Paul has created 16 hand cut stencils that were used to transfer the designs onto two table tennis tables, one to be permanently sited at Michaelstone Community School, the other at Woodlands High School. 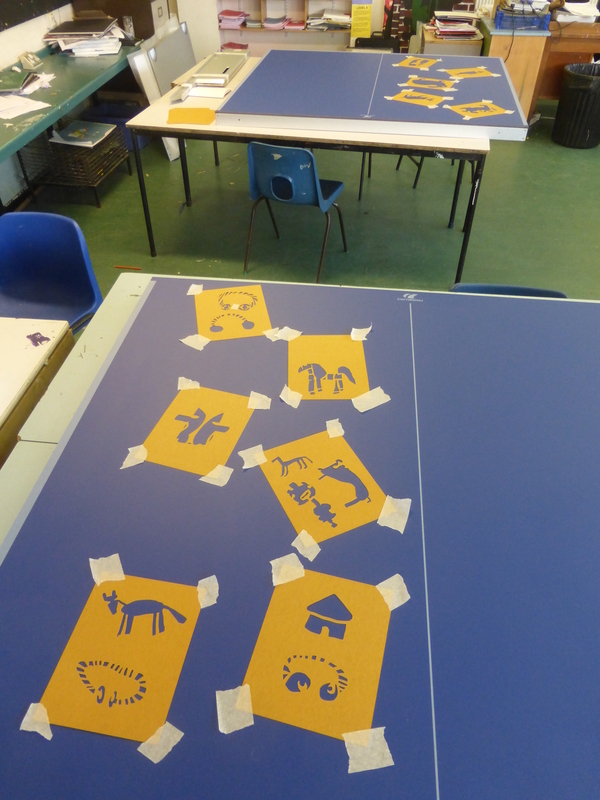 Testing the layout – hand cut stencils in place at Michaelston Community School. Stencilling complete – The Michaelston Table. 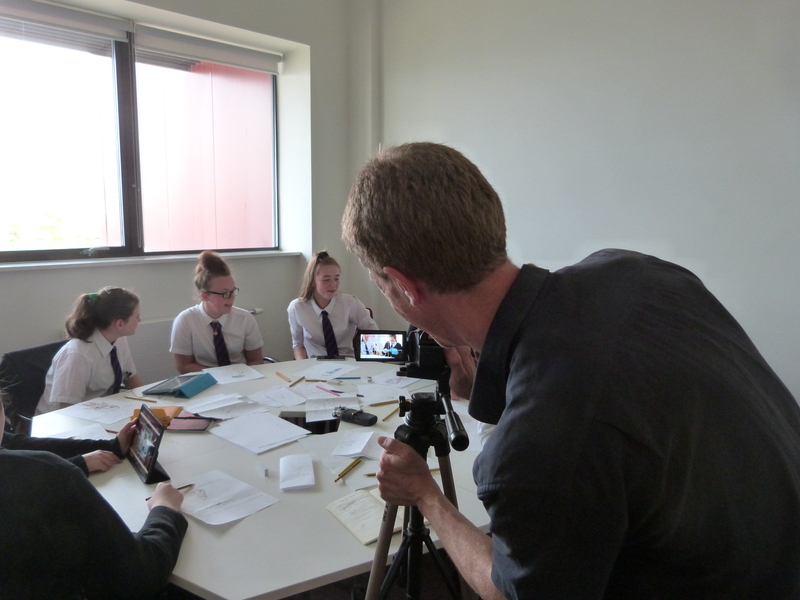 The third and final Romanobritish workshop, which took place at Glyn Derw High School in late October 2015, was all about focussing on the output of the Romanobritish project – a design for our ‘Ping Pong Portal to the Past’. 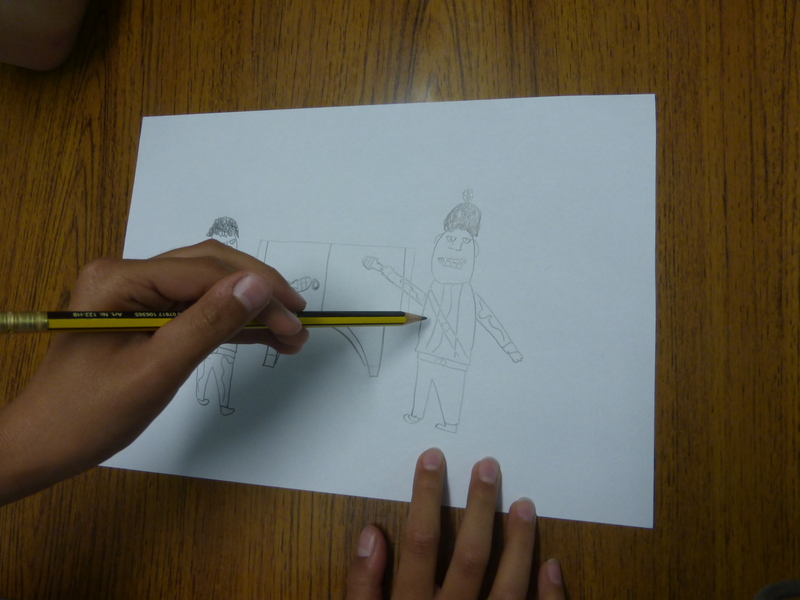 We began the day with the enjoyable but challenging task of creating a cartoon ‘Romans v Ancient Britons’ table tennis match. Romanobritish lead artist Paul Evans handed out an example of what such a match might look like, but our young people had no problems creating their own, individual, unique interpretations of this scene. Question is who would win? Answers on a postcard to CAER Heritage Project please! Bringing it all together – our Romanobritish table tennis design emerges. 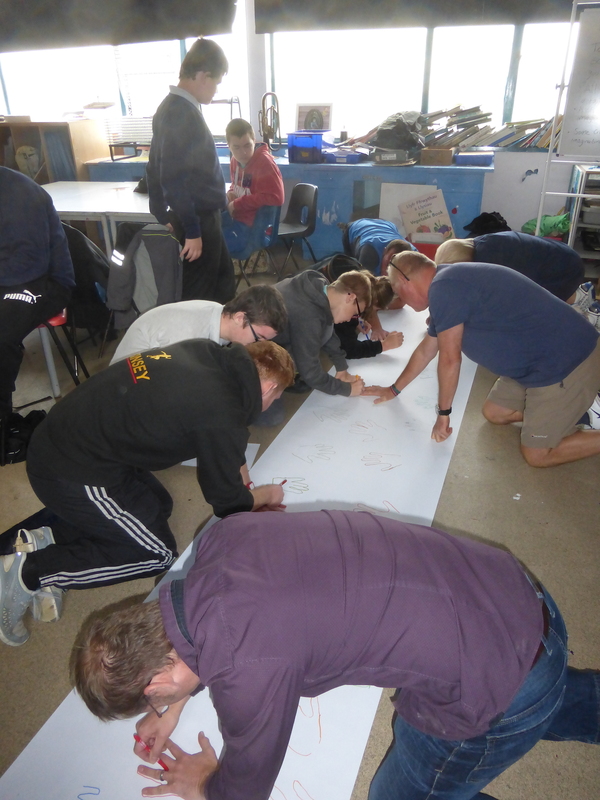 Finally, we collected all of the ideas, drawings and motifs developed over the three days of workshops and transferred the best of these onto A0 sheets of paper laid out to scale with table tennis markings. All of these will now feed into the final designs to be developed by lead artist Paul Evans over the next month. These will then be transferred onto the outdoor table tennis tables sat Woodlands High School and Michaelston Community College sometime during the first few weeks of 2016. A tribal emblem for the ‘Salmon Tribe’. 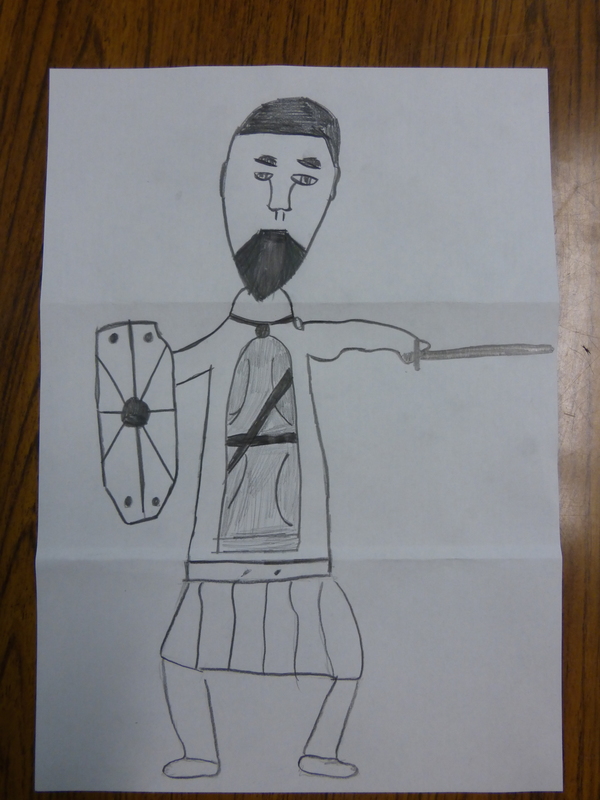 Day two of the RomanoBritish project was once again packed full of creativity. 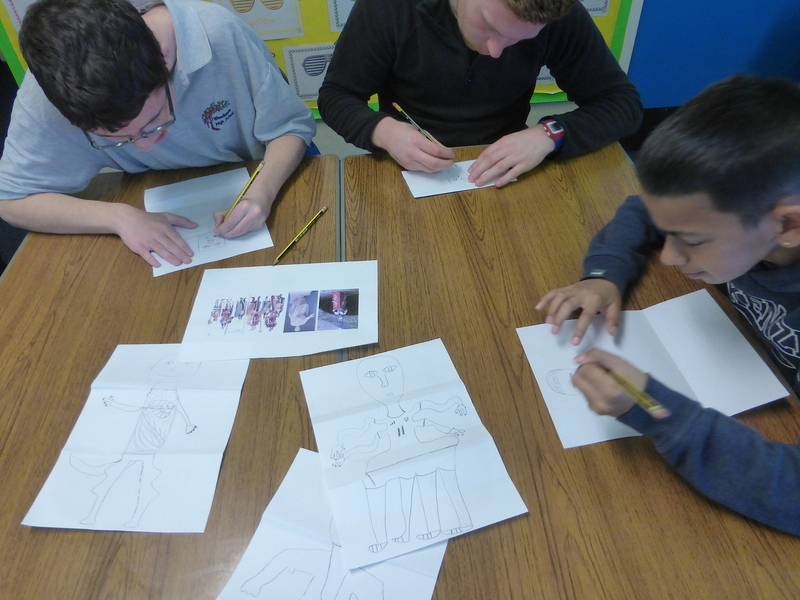 After a review of last week’s activities we warmed up with a customised version of the surrealist parlour game Exquisite Corpse. Although this has a rather alarming title, it’s actually a very simple, fun and creative drawing game involving paper folds. After the first stage, during which we created some spectacular mixed-up monsters, we applied the same format to the Romans and the Brits. The next activity took us outdoors and onto Trelai Park where the Ely Roman Villa is buried*. 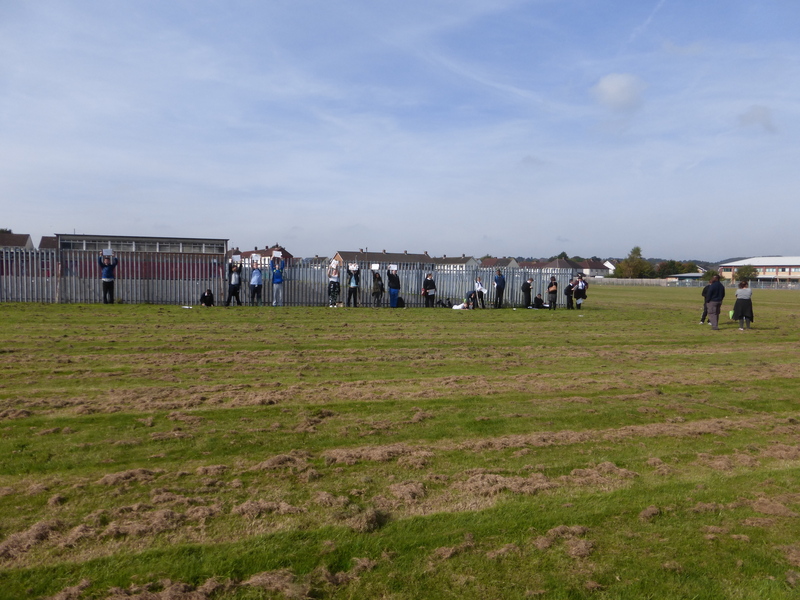 Measuring out a 30m line – where 1mm represented a year, 1m a thousand years – the young people were each allocated a millennium, made a sign for this year on paper, and then physically spaced themselves along it to scale. This really made us think about the huge distance that we need to go back into deep time to encounter the very earliest cave art that we explored in RomanBritish Session I . Measuring out our 30,000 year timeline. Once we had established our timeline we located the millennia to which our examples of ancient art belonged, drew them onto luggage labels and tied them in place. Attaching examples of ancient art to our timeline . Returning indoors we then looked further into the culture of ancient Rome. ‘Carpe diem’ … Seize the day! The Romans have developed something of a reputation amongst historians for ‘colourful graffiti’ so we decided to turn this idea its head and create some colourful, contemporary, ‘graffiti style’ versions of Latin phrases. 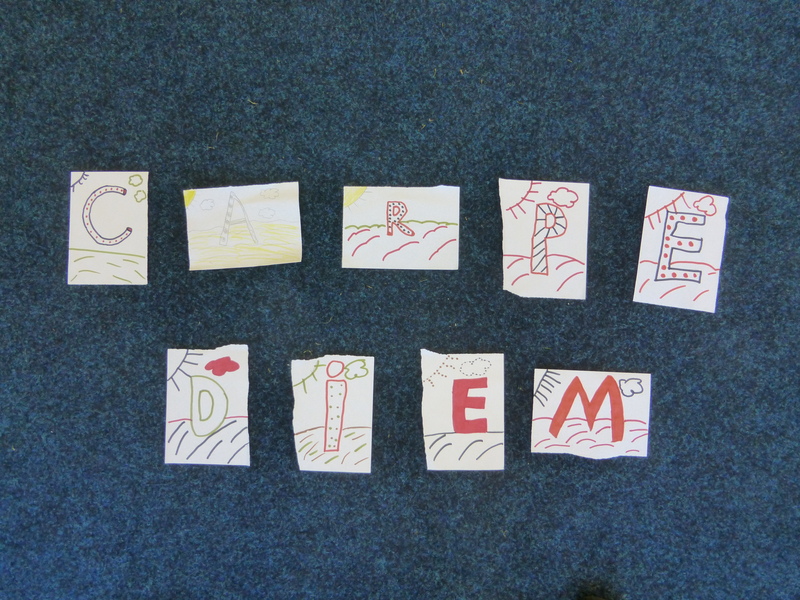 These were created collectively, each of the young people designing their own Roman graffiti letter which were then compiled into classical sayings. 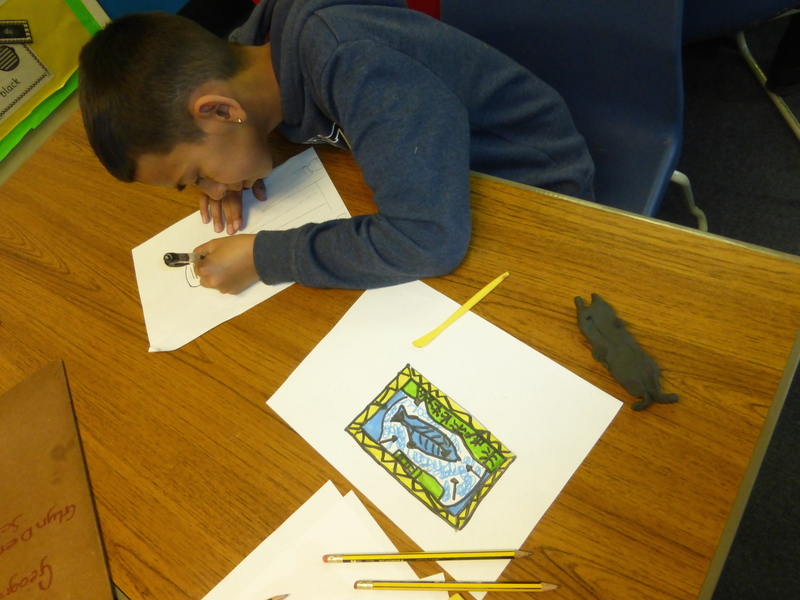 We then explored the mosaics that were used by the Romans to decorate various surfaces. One a number of beautiful mosaics that were produced in this part of the workshop. *Roman Villa site: In 1894 a first century Roman villa was discovered on Ely Racecourse and excavations were carried out in 1922. The site of the villa is still visible as an unmown area in the middle of Trelai Park, although the excavations have been covered over. The site is a scheduled ancient monument. 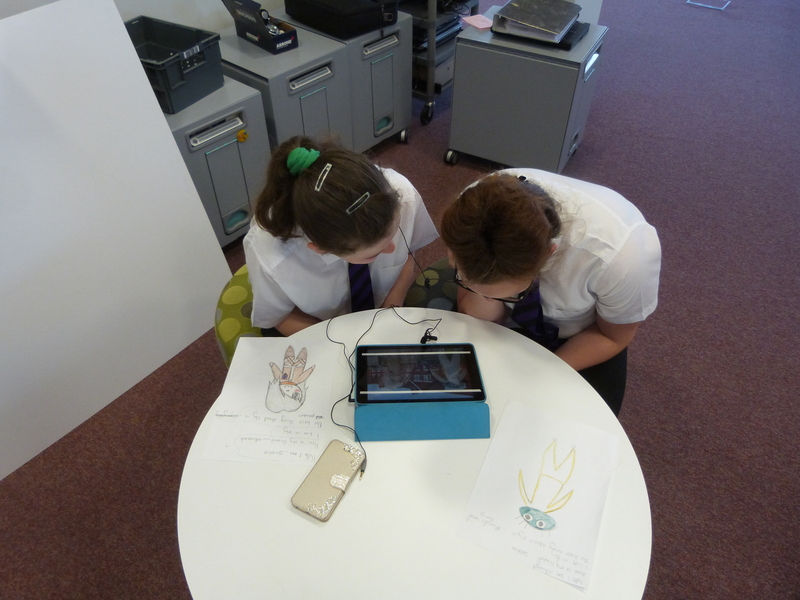 Romanobritish is a new project that is being run in partnership between Woodlands School, Glyn Derw High School, Caer Heritage Project lead artist Paul Evans and Dr David Wyatt from Caer Heritage Project. 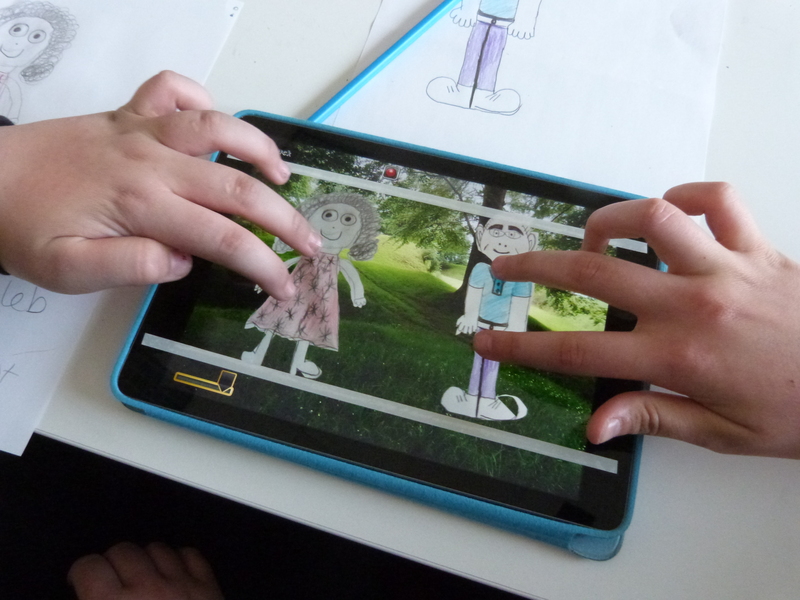 The aim of the Romanobritish is to co-produce designs for playing surfaces of two table tennis tables that will be permanently sited within Woodlands and Michaelston Community Schools. These ‘playable artworks’ will act as ‘ping-pong portals to the past’ with eye-catching designs based on artistic motifs from the Romanobritish cultural period that began after the Roman conquest around AD43. The first session, however, focussed on art that preceded this time and amounted to a whistle-stop tour of artistic prehistory. 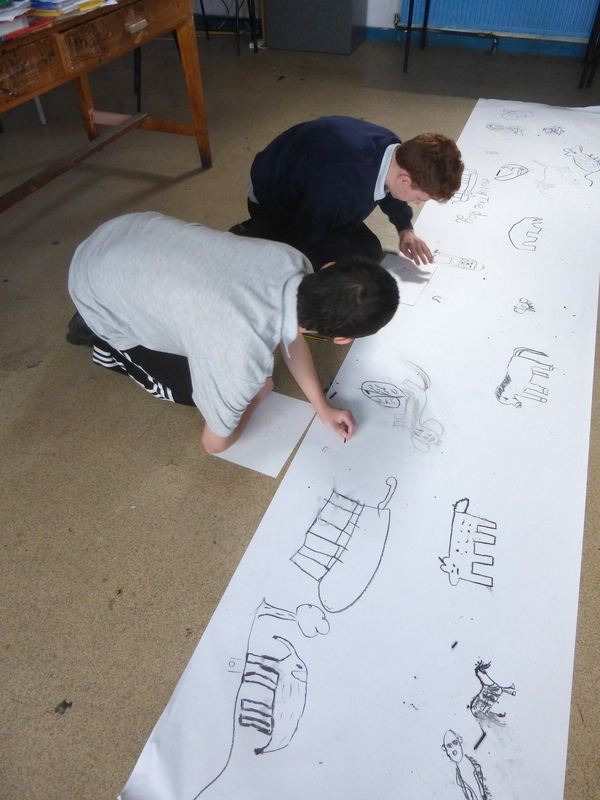 The Romanobritish project will feature a number of collaborative artworks during the course of the project and our first piece was based on the theme of very ancient hand stencils which feature in the most ancient cave paintings, dating back some 40,000 years. These hand stencils were originally created using blown paint but we decided to use felt tip pens to trace our hands. 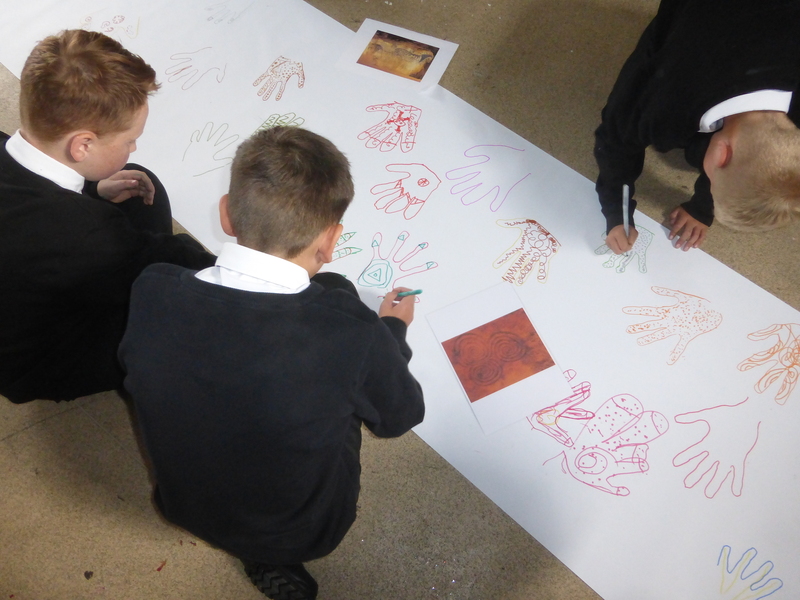 Everyone in the class room – teachers, class room assistants and young people each traced their own hand onto the paper and decorated in with patterns based on the very earliest rock art and spiral motifs that appeared in the Neolithic. 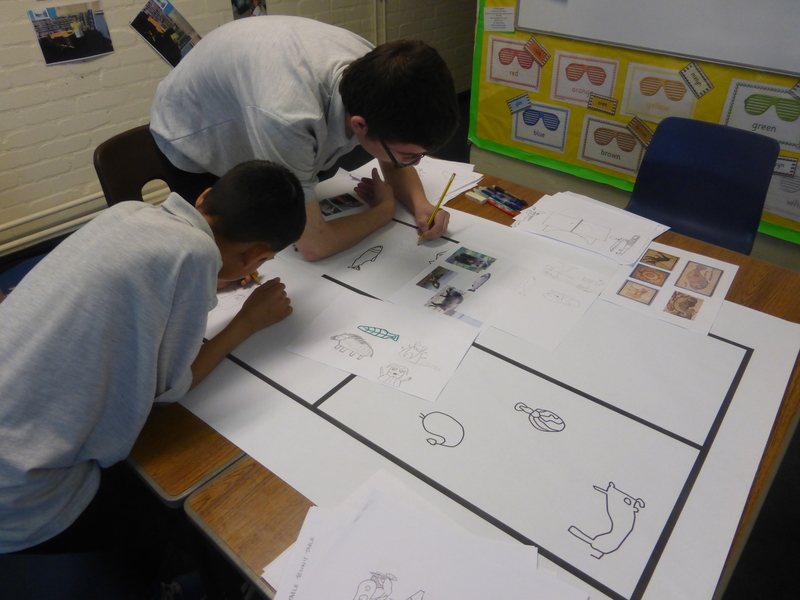 We then looked at Palaeolithic representations of animals and considered the conditions under which they were made – in the dark, deep in the ground, from memory. 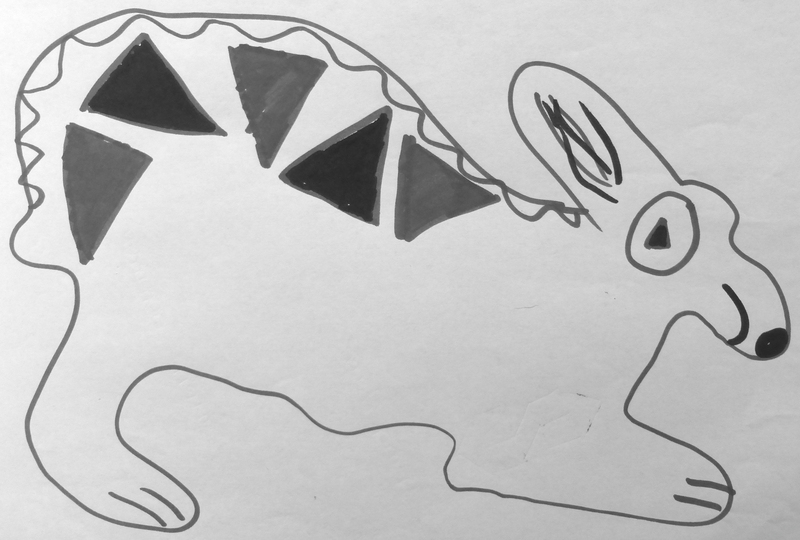 We each drew an animal from memory using charcoal – a material that would have been quite familiar to our ancient ancestors – again creating a group artwork, representing our collective identity. 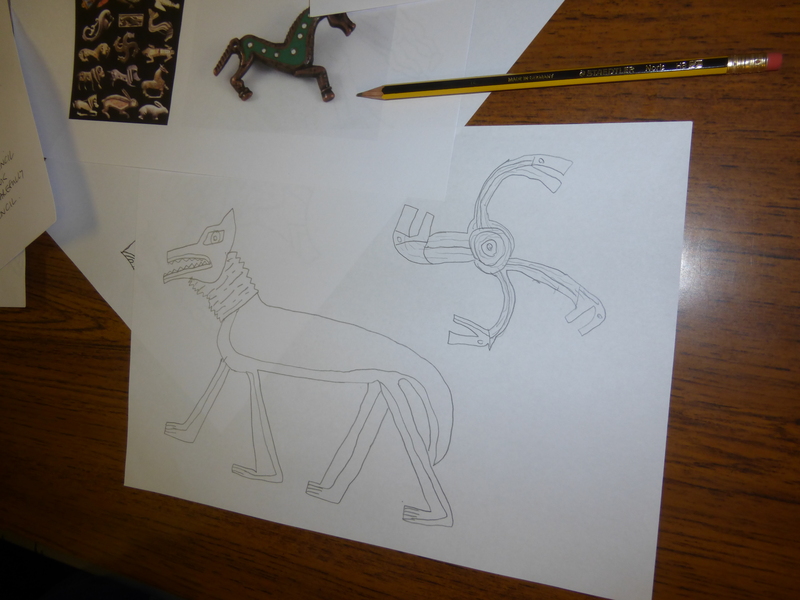 The final creative task for a very busy morning was to make an individual artwork in homage to the Bronze Age . 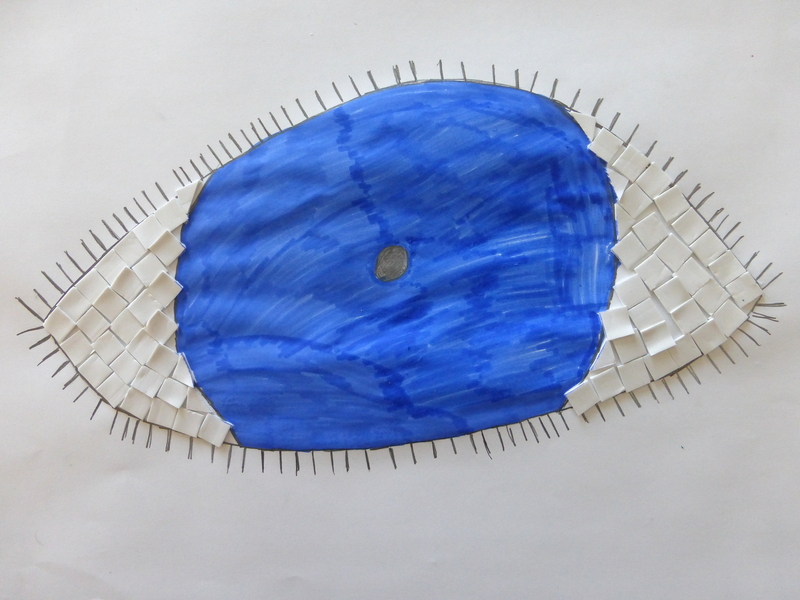 After looking at images of golden masks, we made a simple, mask-like form in plasticine. 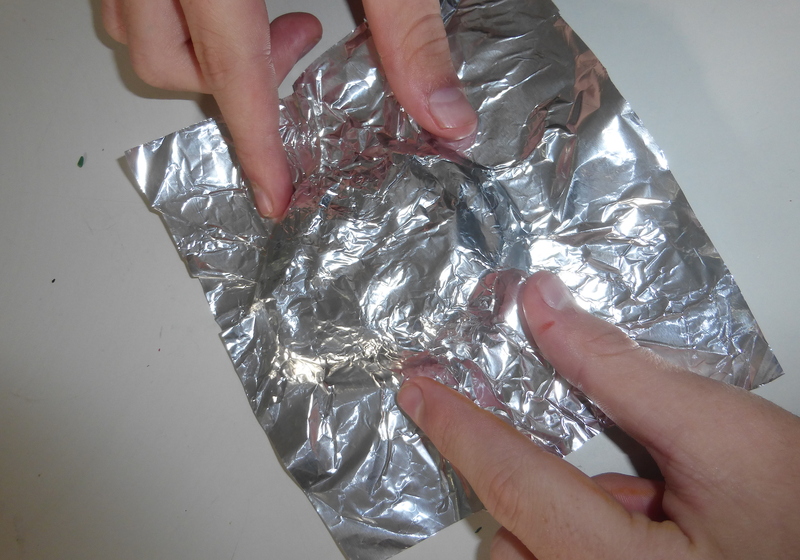 We then used another soft, shiny metal – aluminium foil – to mould around this. Moulding aluminium foil around our ‘Bronze Age’ mask. Dr Dave Wyatt then made a short presentation on Caerau hill fort and its place in Romanobritish culture to the group which prompted lots of lively discussion. Dr Dave Wyatt leads a lively discussion on Romanobritish culture. 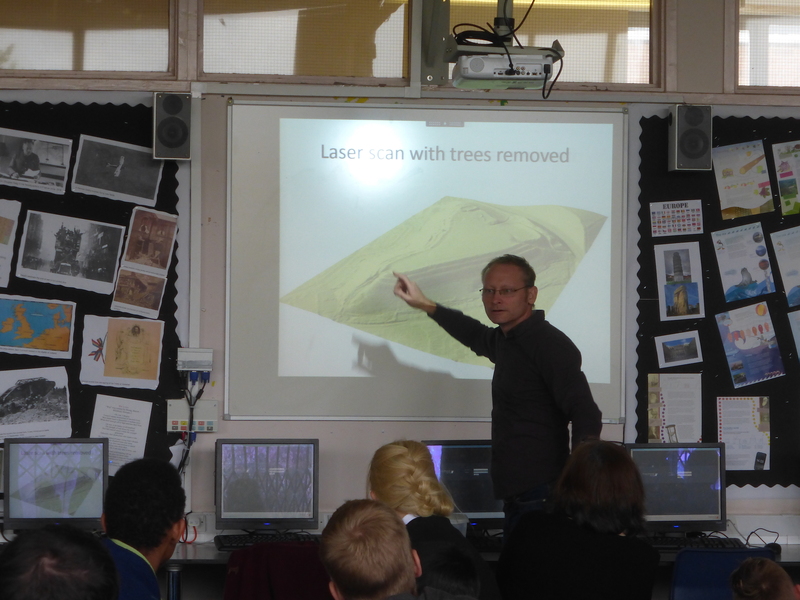 The session was finished off with the young people being offered the chance to handle some recent finds from the dig – some of which had been buried out of sight for over 2,000 years. We are grateful to the staff and pupils of Woodlands School and Glyn Derw High School for making this a very special day. 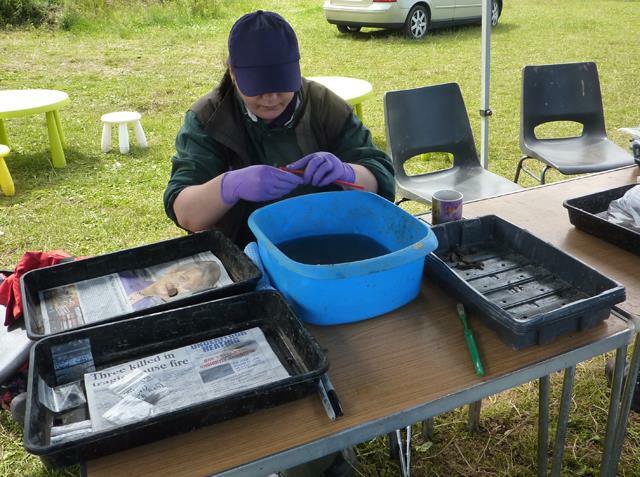 On Monday 6th July I returned to the archaeological dig at Caerau Hillfort for the third year in a row. Together with my trusty support worker, and with trowel in hand, I was rearing to go. Unlike previous years where the weather has been baking hot and extremely bright, the Monday was grey, overcast and we even had a few showers. However, this helped keep the dust from the digging to a minimum. 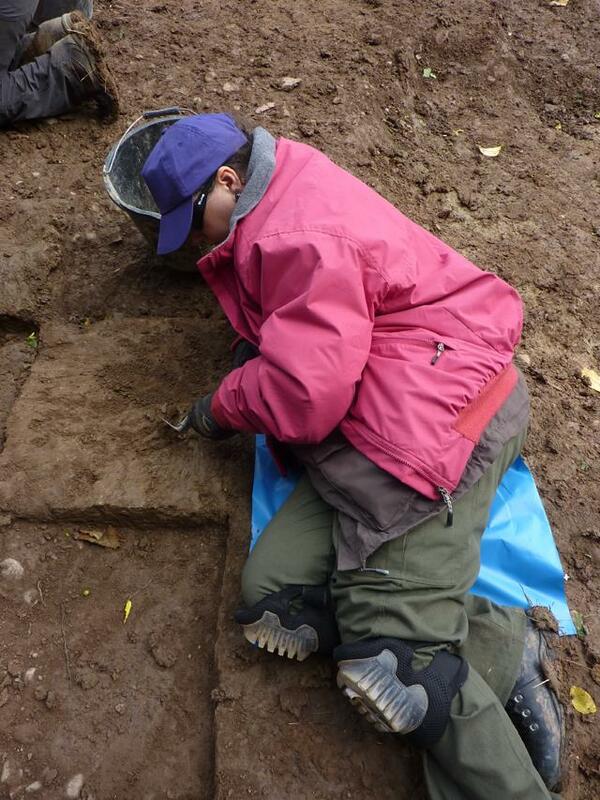 As there was insufficient space for me to layout for digging in Trench 3, I was assigned to sieving. I was using a large rectangular sieve set in a tripod structure to go through the buckets of soil from Trench 3 to start with. I didn’t find anything, unfortunately, but others have found pottery shards and the like in Trench 3 over the last 2 weeks. After the break I was assigned to Trench 5a and with my lovely assistant Ellen (I do hope I’ve spelt that right), we used a similar large sieve to go through the soil coming from Trench 5a. Whilst Ellen found numerous bits of pottery and even a small fragment of bone, I only found a thick pottery sherd. Dating of these sherds is hesitant at present and we await the arrival of a pottery expert to assist with this. Despite the showers and slightly lower temperature, today was productive and insightful, and I eagerly awaited tomorrow’s adventure! Tuesday 7th was a wet world! As the wind guested and clouds moved across the sky, one minute sunny, the next gray; I sat under a small gazebo and washed finds from Trench 3. To wash finds you need a tray with the finds in, a tray with some newspaper laid down, a bowl of clean water and a toothbrush. Gently brushing the find with a damp toothbrush, the soil and debris on the find is removed to reveal what lies beneath. Warning, never dip the find in the water! I worked mainly on different types of pottery and some bone fragments. The pottery was interesting and I mainly cleaned three types; thin, black ware; medium dark brown ware and thick coarse ware. We await a pottery specialist to accurately date there fragments but as they were found in a Roman age midden it’s fair to say they may be Roman in age. Some of these fragments had slightly visible patterns and faint ridges or lines as well as edges. Cleaning finds is as important to an archaeological dig as the digging itself. Without careful logging, cleaning and preservation of the finds we would have little idea about the use and relative age of the site. It’s also exciting to hold something in your hand that may have last been held 100’s of years ago and wonder if it was a precious, cared for possession or if it was a ubiquitous transportation vessel and given as little thought then as the thought we give the bottles we drink out of today. 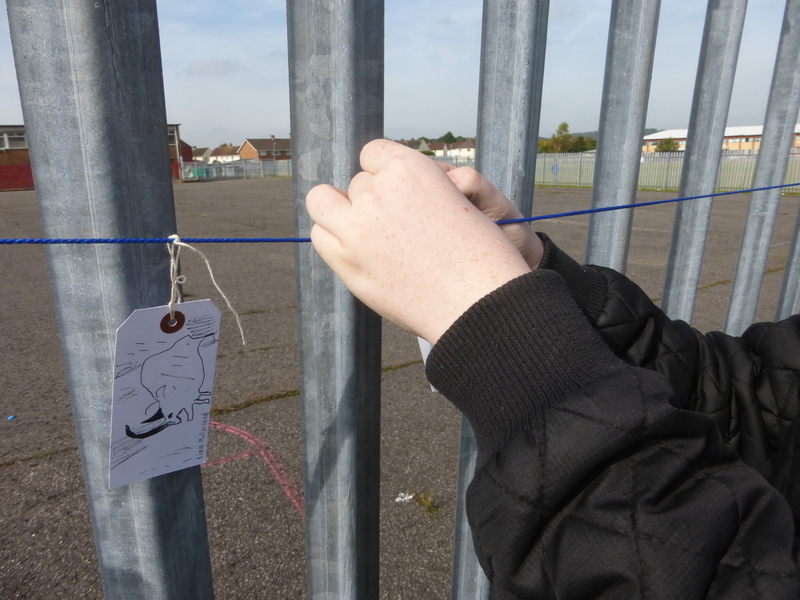 Wednesday was all about ‘square 33 and the hidden treasure’! Despite the rain and the gooey chocolate cake like mud, I was laid out in trench three, digging a Roman midden! We used a slightly different technique to dig here, excavating the midden in squares so that all finds could be recorded accurately. I was allocated square 33 which was 50×50 cm and asked to dig down 10 cm’s; sieving as I went. At first the going was tough and the site seemed barren. 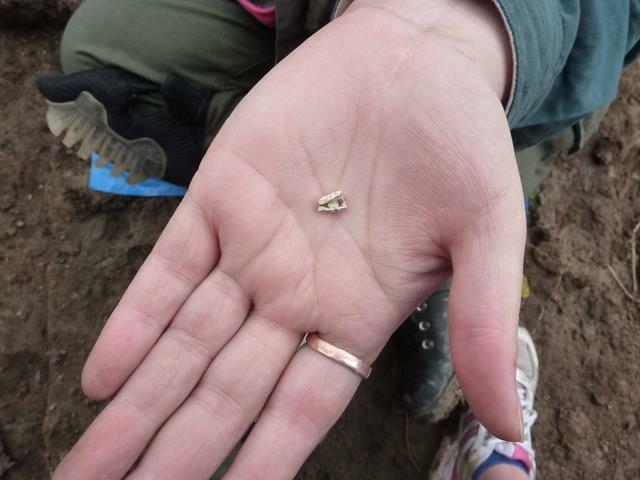 However, I did find (after a couple of hours of digging) a small fragment of white bone, possibly animal; and a little while later a large fragment of Oxford pottery. 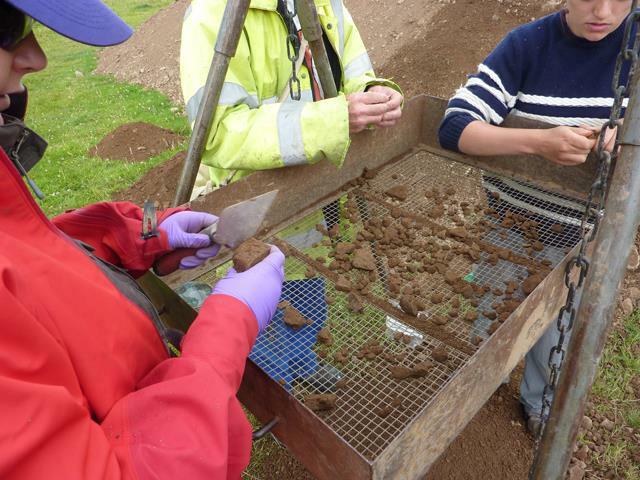 Digging is obviously the most important part and main focus of an archaeological dig. It’s important to be careful while digging not to accidentally destroy finds with over enthusiastic use of the trowel. It’s important to note this as one digs down through time. While I didn’t finish my square in the time allocated, overall today was a productive and exciting day.